City slicker con men Jessica Nakamura, left, Abel Coelho and Michelle Hurtubise strike a pose in "Six Jizo Statues (Roku Jizo)." The UH-Manoa theater program excels at traditional east Asian productions in which the dialogue is in English, but the costumes, staging and actors' performances come as close as possible to what would be seen in China or Japan. Whether the show reflects the comic traditions of kabuki as seen in "The Summer Festival: A Mirror of Osaka" in 2000, or the modern agit-prop theater of the People's Republic of China represented by "Shajiabang: Spark Among The Reeds" in 1994, these impressive productions consistently provide Hawaii residents with a sense of these fascinating genres. 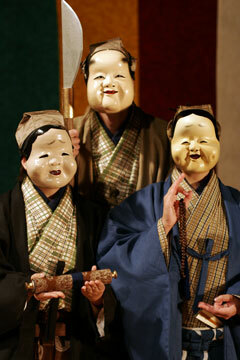 "Kyogen: Timeless Comedy" is no exception. Although relatively little cultural background is provided in the playbill, first-timers will quickly figure out that this style of Japanese comic theater is highly stylized, with characters speaking in a formal sing-song manner, and certain key phrases repeated several times in each conversation. Much of the "sophisticated word play" that project director Julie A. Iezzi mentions in the playbill is probably lost in translation, but actors' execution of the broader physical comedy came through quite well with the audience on Sunday. The colorful costumes, elaborate wigs and minimalist set all add to the sense of what it would be like to see a similar program of four one-act plays in Japan. The cross-cultural ambiance is further heightened as several cast members deliver their lines with strong Japanese or Chinese accents -- a perfect touch. Iezzi opens with the least complicated of the four short stories and closes with the most elaborate. In "Three Pillars (Sanbon Bashira)," a great lord (Daniel Akira Nishida) orders three servants (Suzannah Uluwehi Mills, Monica Ham and Ai Ouchi) into a nearby forest to bring back the pillars he needs to complete his mansion. "Hakama for Two (Futari Bakama)" finds a childish young man (Jeremy J. Dowd) insisting that his older brother (Alan Shepard) accompany him on a formal courtesy call on his new father-in-law (Daniel Sakimura). Etiquette requires the young man to wear a hakama (a Japanese garment), and because the older brother wasn't expecting to enter the house, complications ensue when the father-in-law insists that he come in as well. An obnoxious loudmouth poetry teacher named Taro (John Oglevee) is the protagonist of "A Measure of Courage (Chigiriki)." Taro arrives uninvited at a poetry writing party and behaves so badly that the others eventually beat him up and toss him out. It seems at that point that Taro has had enough, but egged on by his loyal but shrewish wife (Sharon Wezelman), he goes looking for revenge, and perhaps a reaffirmation of his masculine dignity as well. Oglevee and Wezelman are an engaging comic duo, and their work together gradually suggests several alternative interpretations of the true nature of the relationship between Taro and his wife.